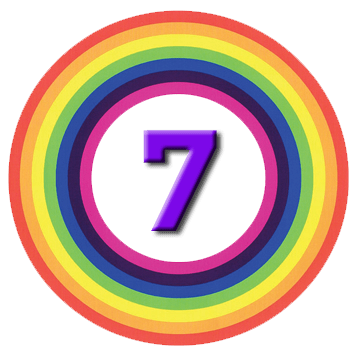 Our previous three visits to Phil Oakley’s book looked at how to find a high-quality company that isn’t carrying too much debt. Today’s post is about the third leg of the stool – value. Valuing shares is not a precise science. The best approach is to err on the side of caution. One common starting point is “fair value”, which usually involves a discounted cash flow (DCF) calculation. The problem with this method is its extreme sensitivity to the chosen discount rate, and to a lasser extent the unreliability of cashflow forecasts that are a signficant period into the future. Phil uses Domino as an example. In July 2016 the shares were priced at 320p. Estimate free cash flow per share for, say, 10 years. 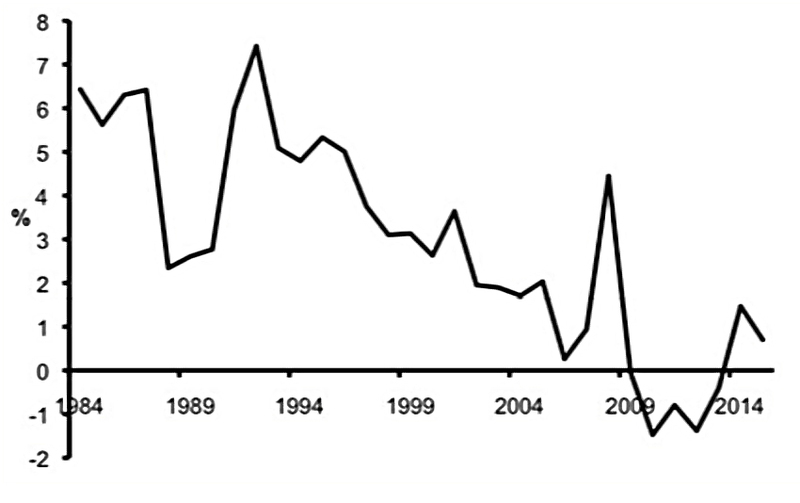 Phil assumes 10% growth for the first 5 years, then a 1% decline per year, to reach 5% at the end of 10 years. This is the long-term growth rate, or g.
Choose the discount rate, or d.
Phil cleverly characterises this as the “interest rate you want to receive in order to invest in the shares”. Phil uses 10% pa, which seems pretty high to me, but presumably he’s building in a “margin of safety”. 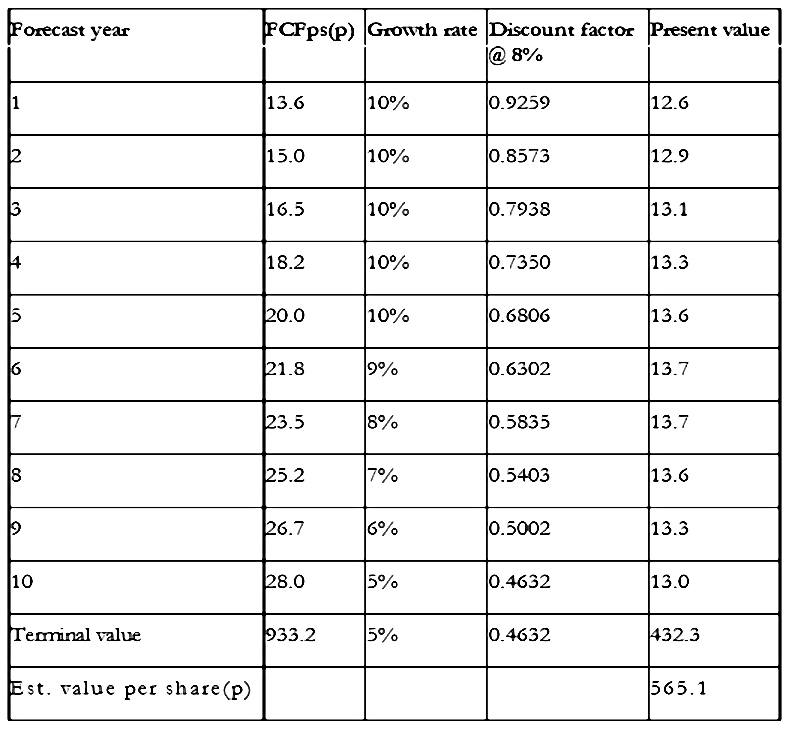 Work out the potential value of the shares in 10 years, and discount that value back to today. 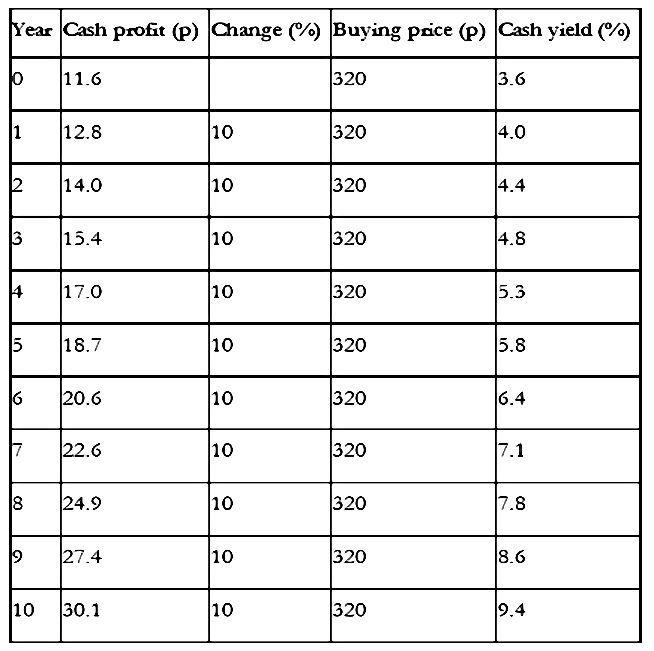 Add in the present value of the cash flows in the years up to year 10. For some reason this is shown as 578 in the table. 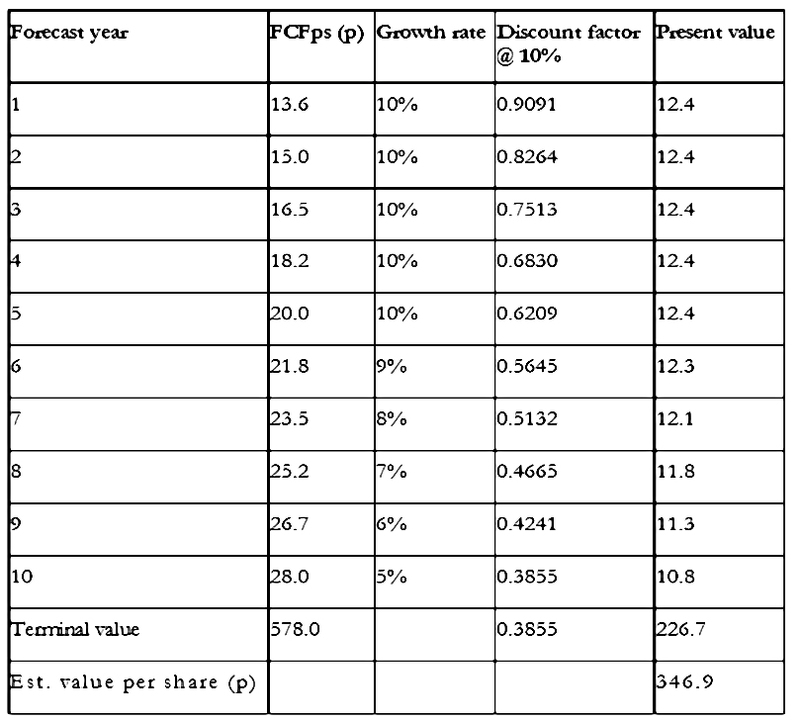 Each FCF is discounted by the appropriate factor to calculate its present value. 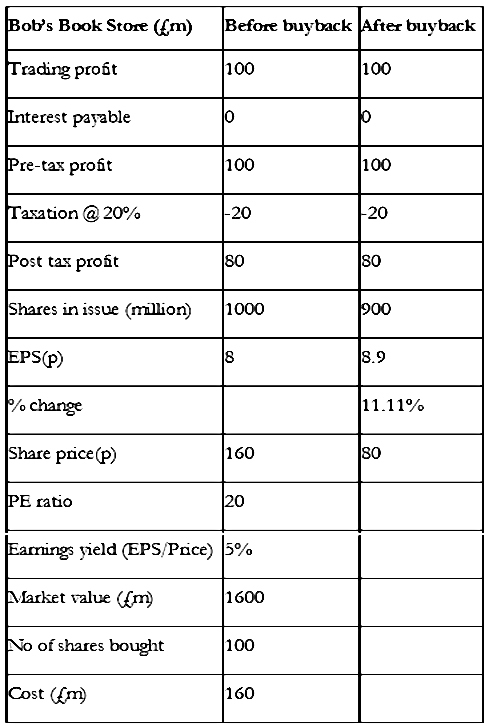 The total value of the shares is the sum of the discounted FCFs plus the discounted terminal value. This works out at 347p – slightly more than the share price. 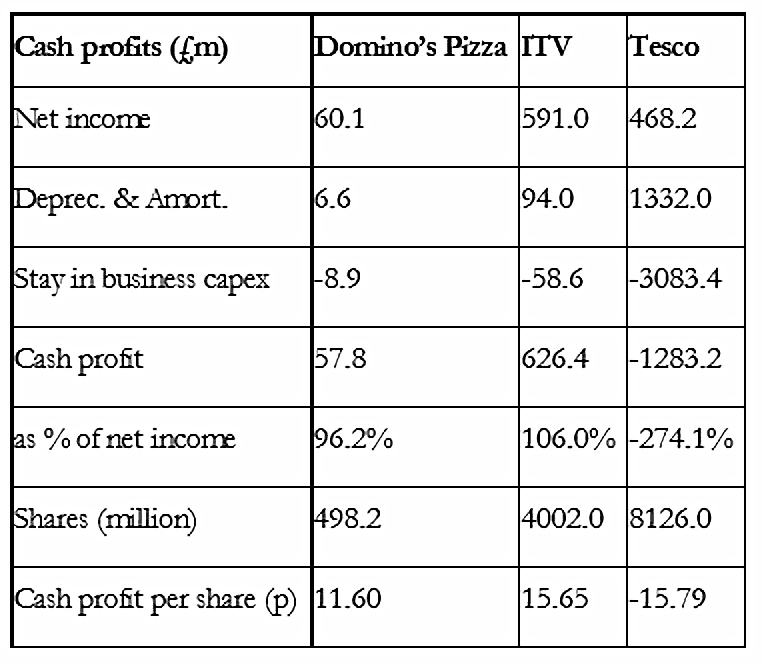 Which means that Domino’s must grow at these rates for the share price to be slightly higher than it is today. 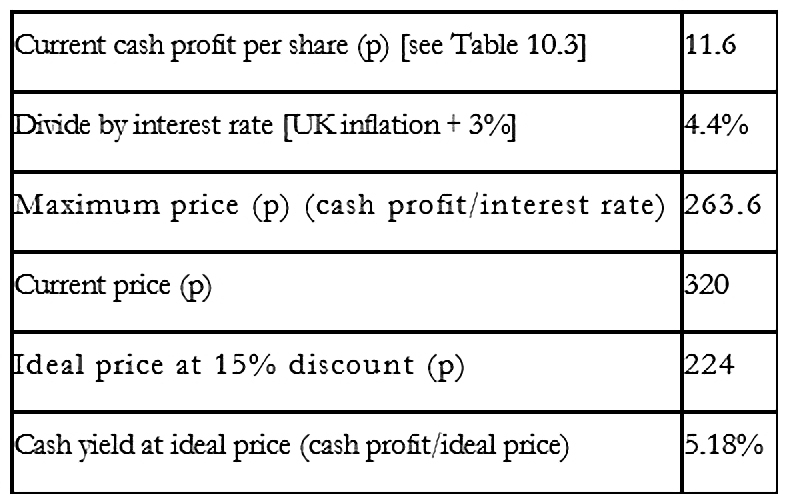 Using a discount rate of 8%, the value of the shares is 565p implying that the shares are cheap. Phil suggests that a higher discount factor be used for small and / or indebted firms, since they are more likely to go bust. I’m far from convinced that many investors use DCF analysis to value shares. Though it stands to reason that after a profit warning, people can work out that a share is worth less. A rise in general interest rates means that the “interest rate” people require to hold shares will also rise, pushing down the breakeven purchase price. At the same time, I accept the underlying principle that low interest rates (as today) underpin high share prices. Phil accepts that most people use “shortcuts based on multiples of a company’s profits, cash flows or assets” instead. through investments in assets or through buying another company. 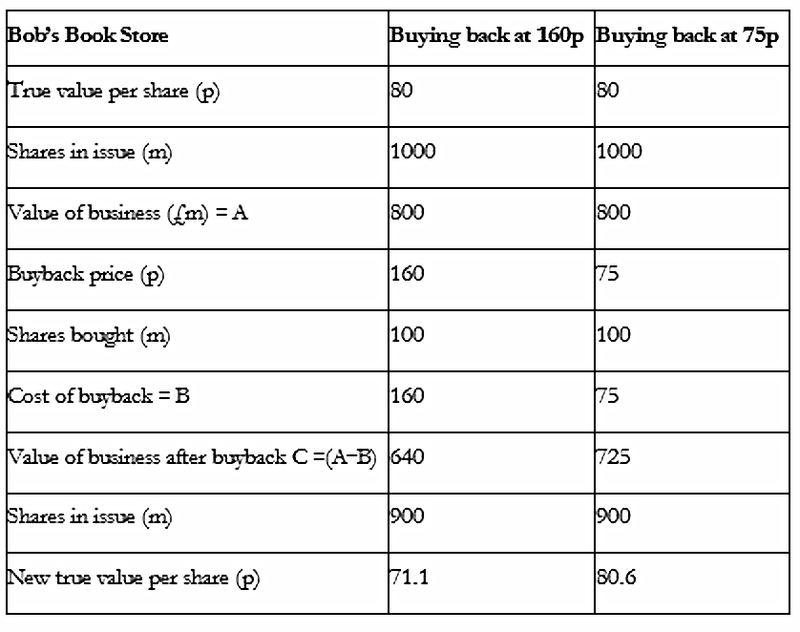 Share buy-backs will also boost EPS, as Phil illustrates using Bob’s Book Store. Bob is making £100m of trading profits every year but finding growth difficult. The stock market is high, and the firm has a PE of 20, valuing it at £1.6 bn (despite low growth). Bob buys back 10% of these for his £160M of cash. Berkshire only buy back shares when the stock price is at a significant discount to intrinsic value (as calculated by Warren, in a non-transparent fashion). For the purposes of illustration, Phil assumes that a year later Bob’s shares are worth 80p, a PE of 9 on the new EPS of 8.9. Buying at 160p has reduced the value of the stock to 71p. Had Bob paid 75p, the shares would now be worth 81p. In our previous visits, Phil looked at cash flow as a better (less easy to manipulate) number than profits. We need to work out cash profits instead. Phil gives Whitbread as an example. This won’t work if the cost of replacing assets is falling. Phil prefers this option to the multiples method. He uses the higher of the 5yr and 10yr averages. 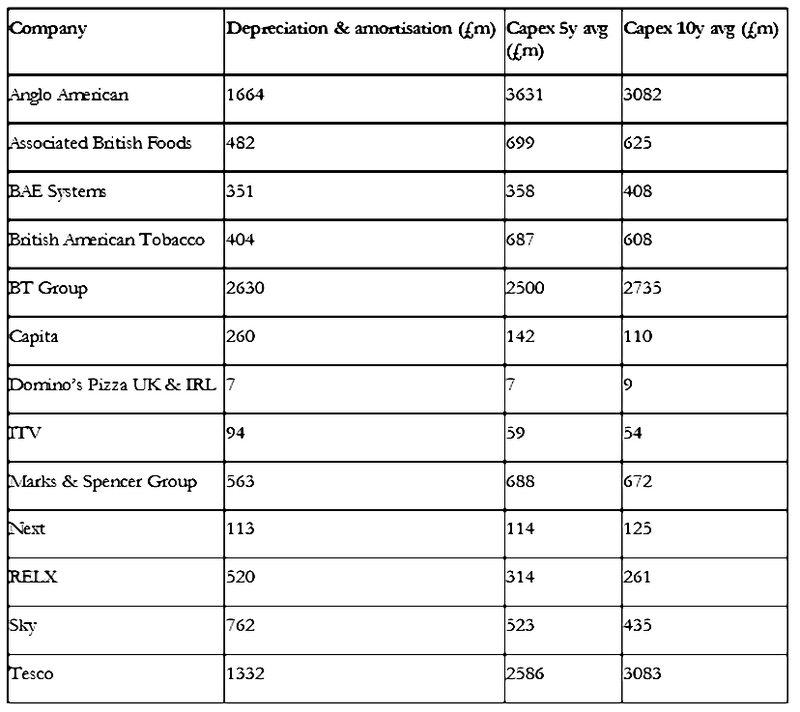 Sometimes, in asset intensive companies like Anglo American (mining) or Tesco, depreciation is higher than average capex. From this, you can work out the proportion of the current share price that can be explained by current cash profits (more = cheaper). Low interest rates have recently pushed up the price of “bond proxies” – reliable blue chips, often branded consumer goods companies (Unilever, Reckitt Benckiser, Coca-Cola, Diageo). The best way to think about this is that when bond yields are so low that you don’t want to buy bonds, it makes no sense to use the bond yield as the target interest rate for the shares you plan to buy. This gives a multiplier of 15.6 (= 1 / 6.4%). This gives a multiple of 22.7 (= 1 / 4.4%). That’s a fine target for a stock, but I wouldn’t expect to find too many qualifying stocks in the current bull market. And we would be looking for the best companies, which are likely to be more expensive than average. It looks like Dominos is too expensive. The maximum price is 263p, compared with an actual price of 320p. With a 15% margin of safety, the target price is 224p. Phil also adds a sell rule at 25% above the maximum buying price. In his example this would be 329p. Phil notes that “over-paying” for the best companies can work out in the long run. The examples are: AG Barr, BAT, Cranswick, Dignity, Diploma, Domino’s, Fidessa,InterContinental Hotels, Paddy Power Betfair, Reckitt Benckiser, RELX, Rightmove, Sage, Spirax Sarco and Unilever. Few could have been bought at any point for cheap prices. Value companies using cash profits. Work out the cash yield – is it high enough? Don’t buy shares where more than 50% of the price depends on future growth. Work out the maximum price you will pay for a share. Try to buy at a discount of at least 15%. Use an interest rate of at least 3% more than inflation. Only over pay when you are very confident in future profits growth. The higher the price you pay, the more risk you are taking. And that’s it – we’ve completed our journey through Phil’s book. I found today’s section very straightforward to follow and very useful. I’ll be back in a few weeks with a summary of the whole book and the lessons we can learn from it.